Seed questions for reflection: What comes up for you when you reflect on how your heart is doing? Can you share a personal story of a time you were able to move beyond busyness and into the state of your heart? What practice helps you examine the dark corners of your own soul? it is not enough to ask how your heart is doing.we 'd better do sth to make one's heart happy. I love the question "How is your heart at this very moment, at this breath?" That is so personal, so present. That's so different than, "How's it going? or "Hey" or whatever other When I share the state of my heart, I am open -- it sometimes feels risky, it often elicits a personal response from the other. That kind of interaction is intimate and is what is most worthwhile in living. The practice of examining the dark corners of my soul and being with another who is doing the same helps me to want it and do it all the more. The author says he doesn't have a magical solution for our busy,doing, heart avoiding culture. The solution is in sharing "How is your heart at this moment, at this breath?" DIL SE. DILWALE. DILARAM (Dil+AaRam ) When we connect soul to soul ,it is relaxation,Its Ram, All souls being full of love,peace,power & purity without any artificiality. I find genuine hugging(human touch) is always from heart. In learning how to authentically ask the question to another, there is also the step of learning to ask ourselves that same question. 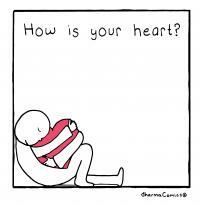 Can I pause several times a day, connect to my own heart and compassionately ask the question: How are you doing dear heart in this moment? There exists the challenge of pausing our busyness to take the time to ask the question. The greater challenge may be to create the space to truly hear the answer. Just like we expect a simple "fine" when asked "how are you? ", it's easy to fall into allowing ourselves to provide a shallow answer when inquiring about the wellbeing of our hearts. And if creating the space to allow an authentic answer to surface was not challenging enough, then comes the challenge of having the courage to acknowledge and respond to its answer.